6 Axis of tool approach control. The WF Series is a high horsepower vertical spindle machine tool that provides six (6) axis of movement: four (4) linear axes (X, Y, Z and W) and two (2) rotary axes. 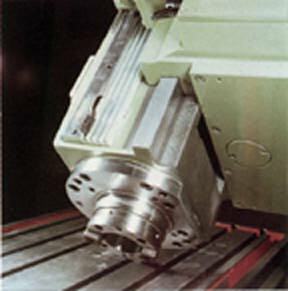 The tilting action of the headstock allows the machine to be used also as a horizontal spindle machine as well. The heavy cast iron construction allows this machine to deliver the highest cutting power available on the market in a true five (5) axis contouring mode using any five (5) of the six (6) axis. Bokö's built in W Axis Slide delivers the angular boring and drilling capability without making the sacrifice in rigidity and straightness of motion a quill style headstock must make. A higher horsepower spindle design completes the package. Versatility, precision through strength and plenty of cutting power at the tool make this machine our customers most favorite for tough jobs requiring higher stock removal rates and close tolerance machining. True five (5) axis contouring capability using any of 6 axis of motion. Send mail to jon.olson@boko.com with questions or comments about this web site. Copyright © 1996 Bokö Services Group, Inc.